The Michigan State University Press has published this 234 page volume that has shot high in Amazon.com sales rankings in short order. Frank Boles has crafted a comprehensive history of Great Lakes shipping that should be part of the library of every person interested in maritime matters in the Midwest. Boles, director of the Clarke Historical Library at Central Michigan University, describes how the Great Lakes create a vast transportation network that supports a massive shipping industry. The Michigan State University Press has published this 234-page volume that has shot high in Amazon.com sales rankings in short order. The Port of Bay City -- as the second busiest port in Michigan after Detroit -- is part of the massive transportation network, and local ship watchers on the Saginaw River and Bay will find much useful and interesting information in Mr. Boles's book. 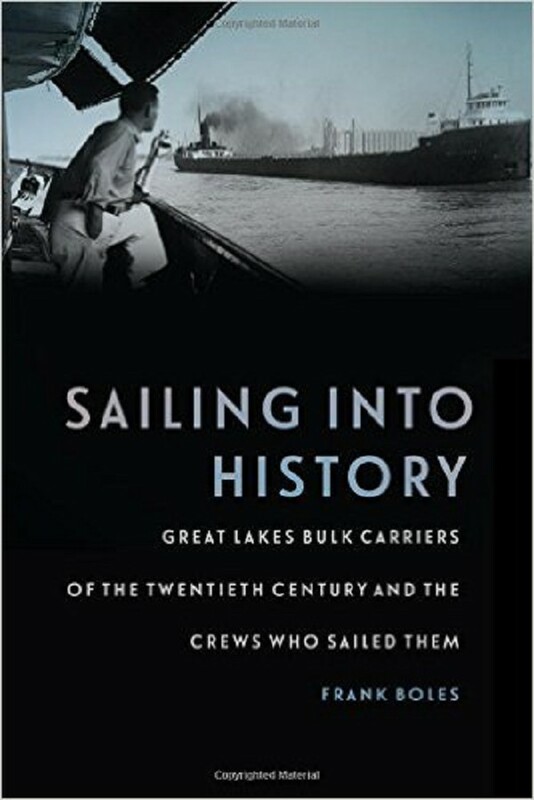 The MSU Press states: "In this volume, seamanship, cargo, competition, cooperation, technology, engineering, business, unions, government decisions, and international agreements all come together to create a story of unrivaled interest about the Great Lakes ships and the crews that sailed them in the twentieth century. "This complex and multifaceted tale begins in iron and coal mines, with the movement of the raw ingredients of industrial America across docks into ever larger ships using increasingly complicated tools and technology. "The shipping industry was an expensive challenge, as it required huge investments of capital, caused bitter labor disputes, and needed direct government intervention to literally remake the lakes to accommodate the ships. "It also demanded one of the most integrated international systems of regulation and navigation in the world to sail a ship from Duluth to upstate New York. Sailing into History describes the fascinating history of a century of achievements and setbacks, unimagined change mixed with surprising stability." Boles aptly describes "the bounty of natural riches," iron, coal, stone and grain, that was moved on the Great Lakes by ships, fueling the growth of an incredibly wealthy civilization in the Midwest. Not since Walter Havighurst's monumental "Long Ships Passing," has an author embraced and assessed the incredibly complex subject as Boles has achieved with this book. Havighurst (1901-1994), longtime professor of English at Miami University, produced a work pronounced "the most readable volume on the five Great Lakes" by the New York Herald Review of Books. It was first published by the University of Minnesota Press in 1938. It seems likely that Mr. Boles's book is poised to equal or supersede Havighurst, no doubt to the delight of all Great Lakes shipping aficionados.